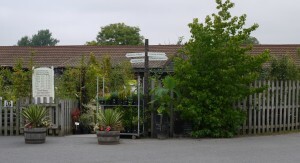 The Hop Pocket Shopping Village becoming even greener! 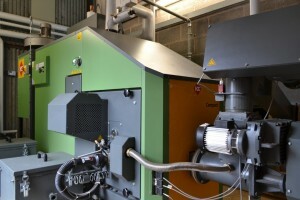 199 kW Wood chip fired boiler is replacing 4 oil fired boilers at the Hop Pocket shopping village in Bishops Frome. This system will save them aprox £10,400 in fuel per annum and earn them aprox £22,488 in RHI payments! The Hop Pocket is a unique shopping village boasting a wealth of independent shops. Spread over a number of old agricultural buildings the site was heated by 4 oiled fired burners producing a total of 130kW of heat. 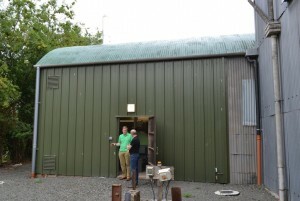 With the rising costs of oil and the age of the heating system the owners decided it was time for a change and with the site continually expanding something was needed to keep the customers warm and happy throughout the winter months. After consultation with both Efficient Energy Centre and Euroheat, the chosen route to go down was a HDG compact 200 wood chip boiler. The advanced combustion technology of the Compact is perfectly designed to burn wood chips as fuel, resulting in very low emission values and extremely high efficiency levels. Features such as automatic ignition, self activated cleaning, large ash container and HDG quality and strength all help to make it a leading bio- mass boiler. helps to improve the carbon footprint of any business, especially in an era when corporate social responsibility is so key.